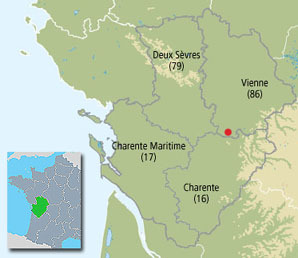 Le Mas is located near the southern border of the department of Vienne, within the Nouvelle-Aquitaine region of France. (formerly part of Poitou-Charentes) We like this part of France because it’s an easy drive from the northern ports while benefiting from the good weather: Poitou Charentes was reputed to be the sunniest region in Western France, with the recorded hours of sunshine second only to the Mediterranean coast. 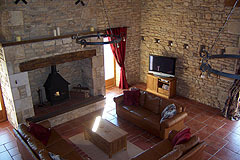 Our house is one of only half a dozen properties in the hamlet of Chez Pingault, which lies a few hundred metres outside the village of Surin. 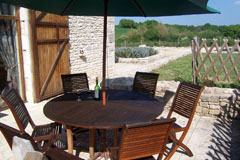 It is located off the D35a, which runs between Civray and Champagne-Mouton. The French motorway network, which is such a pleasure to drive on compared to UK roads, connects all the northern ports with Poitiers. Once you reach Poitiers, the dual lane N10 carries you south towards Angouleme. Half way between Poitiers and Angouleme you reach the Niort-Limoges road which crosses the N10 at right angles. Taking the road to Limoges brings you to Civray; our nearest market town. We will send out detailed driving and access instructions a few weeks ahead of your arrival. Our detailed driving and access instructions include directions from Poitiers and Limoges airports. If you’ve chosen another location let me know and we’ll include the directions from that airport.